Yeah, you read that right. 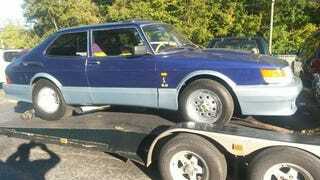 This is a 1987 Saab 900 powered by a Ford 302 V8. It has Cobra badges and an interior fit for Ronald McDonald. Words fail me right now. You are looking at a 1987 Saab. The car is Prostreet, has a pro charged 302 mustang motor in it. 5 speed trans too much mods to state. might trade let me know what you have. The price? It'll set you back $18,500. Here's the ad. It was posted about a month ago. I'm not going to screencap it in case it goes away soon. I want it to go away. Forever.